Registration forms for the Gulf Coast Expo 2008 May 16 -17th in Lake Charles, LA are now available at http://www.gulfcoastfff.org/index.php?page=Expo-2008 . A mail-in registration form (check only) is available. Also available is online registration (credit card or check). A $2.00 processing fee will be charged for online registration. The Gulf Coast Expo 2008 will feature Bruce Richards, Nick Curcione, Tim Borski, and Mark Sedotti plus many programs and workshops. Friday evening there is a crawfish boil, and Saturday evening the banquet featuring an auction an authentic Louisiana cuisine. Over a total of over seventy demonstration fly tiers will be tying Friday and Saturday. The spring 2008 issue of the Gulf Coast Council-FFF's newsletter "Sea to Stream"mis now available at http://www.gulfcoastfff.org/index.php?page=communications . The next meeting of the Contraband Fly Casters will be on Tuesday April 15, 2008 in Room 200 of Kirkman Hall on the McNeese campus in Lake Charles, LA. The fly tying begins at 6:00 pm, with the meeting and program beginning at 7:00 pm. We will be holding a hook and materials swap. Bring your excess hooks or materials and trade for something you need!! The Contraband Fly Casters April 2008 newsletter is now available online. The winter 2008 edition of "Sea to Stream," the quarterly newsletter of the Gulf coast council of the Federation of Fly Fishers is now available at http://www.gulfcoastfff.org/index.php?page=communications . This issue contains excellent articles on shooting heads, rattle flies, fly patterns and more. Wallpaper images of the graphic above are now available. As I collect other images suitable for wallpaper I will add them to the page. The address for the wallpaper page is http://www.geocities.com/chemprof2001/wallpapr.htm. Enjoy the images! I moved to southwest Louisiana in the fall of 1987 from Midland, Michigan. In Midland I fished for walleye, smallmouth bass, crappie and other panfish in the Tittabawassee River, well known for its walleye runs. The Tittabawassee runs in to the Saginaw River and then into Saginaw Bay of Lake Huron. 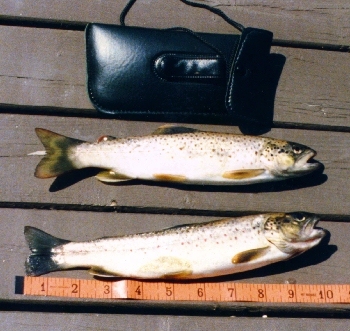 Brown trout fishing was available in the Cedar River a short way north of Midland. In the Great Lakes (I mostly fished Lake Michigan) and tributaries rainbow trout, steelhead, chinook salmon and coho salmon were available. 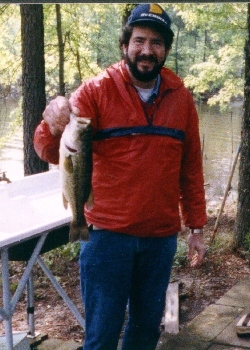 When we moved to Louisiana, I had to learn a new type of fishing, saltwater. 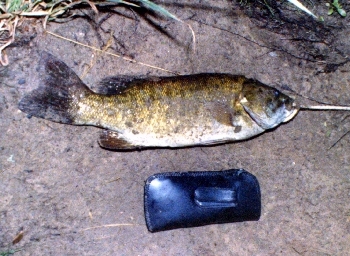 I found that in addition to the bass and panfish that the saltwater species were plentiful and varied. I never know just what I'm going to catch. 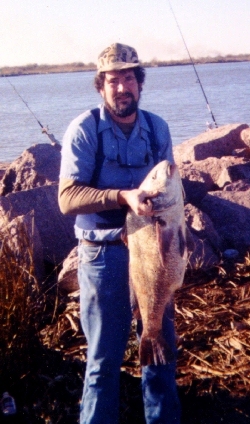 I do a lot of fishing on the beach in the Gulf of Mexico, in Prien Lake, Lake Charles and some in Calcasieu Lake. I've caught redfish, speckled trout, flounder, bluefish, gulf whiting, black drum, gafftopsail catfish, blacktip shark, sand trout, spadefish, jack crevalle, needlefish and I know I'm leaving some out. 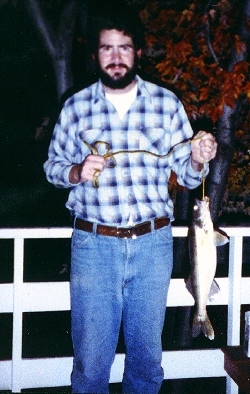 One of my great interests is flyfishing and flytying. 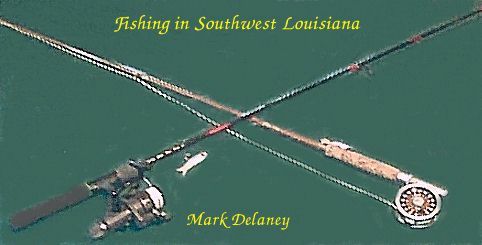 I maintain several pages with fly patterns on them including the 1998 Redfish/Speckled Trout Swap, the 1998 Estuary Swap (organized by Robb Nicewonger), Mark's Bass & Panfish Flies, Mark's Saltwater Flies, the Spring 2002 Saltwater Swap, the Tom Nixon Memorial Fly Swap. and the Second Tom Nixon Memorial Fly Swap. Twin River Anglers "The Tying Bench"
Last update of pages April 28, 2008.